Marc Benioff is a businessman known for his revolutionary impacts in the tech industry with his new category of tech called ‘software as a service’. He is also the founder of Salesforce.com, a software company that practices 100% cloud-computing. Being born into a rich home, Marc refused to follow in the career path of any of his family members; rather he carved out a path from himself. At the age of 15, he had established his first company; Liberty Software, which designed software for Atari games. He also had the opportunity to work with the large software company giant, Apple Inc.
Who is Marc Benioff, CEO of Salesforce? Marc Benioff was born on September 25, 1964, as Marc Russell Benioff. He was born in San Francisco, California into a wealthy family as his father, Russell, owned a chain of clothing stores. His mother is Joelle Benioff and his sister is Joelle Young. Marc attended Burlingame High School and the University of California where graduated with a degree in Business Administration. While in school, he developed his first application, How To Juggle which he sold for $75. He started off his first company at the age of 15 called Liberty Software where he constructed video games like The Nightmare, Crypt of the Undead, King Arthur’s Heir, and Escape from Vulcan’s Isle. As a result, Marc Benioff earned royalties for his work and by 16, he had enough to see himself through college. He was employed as a software developer in Apple Inc. when he was still a teenager and a college student. He worked at the Macintosh areas and helped develop the Macintosh. While working there (Apple), he became friends with its CEO, the late Steve Jobs. They were so close that he attributed the establishment and success of his later-to-be-established company, Salesforce.com to the wise counsels of Steve. Also, Marc and Steve shared spiritual bonds as they indulge in meditation and treks to India; a form of spiritual exercise. After graduating from the university, he began working for Oracle Corporation at the age of 21. There, he took a customer service position to gain experience on how to deal with customers. After working in various departments, he rose to become Vice President with an annual income of $1 million at the age of 26, thus, he became the youngest person to become VP in the corporation’s history. He left Oracle to establish Salesforce.com in 1999. He revealed that he got the inspiration to start his own company when he was in a meeting with the founder of Oracle, Larry Ellison. Basically, Salesforce is a cloud-based software company that has revolutionized the technology world through the slogan: software is service. Its headquarters is located at Marc’s hometown, San Francisco. The company has excelled beyond expectations and has won several accolades including the World’s Most Admired Company (software industry), World’s Most Innovative Company, Best Place to Work, among other awards. The entrepreneurial billionaire has made a fortune from his online company Salesforce.com. Even though the company is just about two decades old, it stands as major competition to iconic companies like Oracle Corporations. From the sales of products from his company, he has amassed a tremendous amount of wealth for himself, surpassing anything his family had acquired. Marc Benioff’s net worth is estimated to be in the upwards of $6 billion ($6.3 billion as at January 2019). 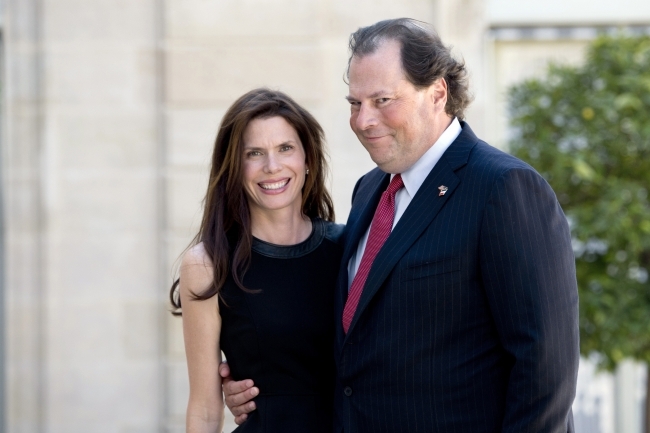 Marc Benioff is married to Lynne Krilich and they have two children together. The date and other details of their union are not known. However, it is common news that Lynne is a generous philanthropist and has headed some charitable works. Prior to that, she served as the director of Public Relations Campaigns at OutCast Communications from 1998 to 2003. The identity of their children are not known, what is known is that they are both girls. Marc Benioff loves parties and events which he often organizes at his family home parties. It is said that he spends as much as $25,000 for each of his parties. He is the cousin of co-creator of the popular HBO series Game of Thrones, David Benioff. He has a 5-acre estate in Hawaii, containing 6 bedrooms, 7 full bathrooms (plus two half bathrooms). He has other estates scattered around San Francisco and other states in the United States. Marc Benioff is also friends with Michael Dell; founder of Dell Incorporation, one of the world’s leading computer manufacturing and sales company. Benioff is a philanthropist. He has a couple of charitable activities attributed to him such as the donation of $250 million to the University of Southern California for a new child’s hospital and the 1-1-1 charity scheme that has been a huge success and a worthy emulation for other companies, among others. He and his wife, Lynne Krilich, bought Times Magazine for $190 million in September 2018. Like most entrepreneurs, he has several awards and honor to his name; some of which are – the Excellence in Corporate Philanthropy Award in 2007 and the Honorary degree of Doctor of Humane Letters from the University of Southern California awarded on May 16, 2014.